(Reuters Health) - Electronic cigarettes are sickening a growing number of young kids, usually because children drink the liquid nicotine that’s used in the devices, a U.S. study of poison center calls suggests. Often, children aren’t seriously harmed, but several have had severe complications like comas and seizures and one child died from liquid nicotine poisoning. Even small amounts of liquid nicotine can cause serious poisoning or death in young children, said senior study author Dr. Gary Smith, director of the Center for Injury Research and Policy at Nationwide Children’s Hospital in Columbus, Ohio. The study, which focused on poison center calls about kids under six years old exposed to tobacco and nicotine, found e-cigarettes posed the biggest risk to toddlers. “Children in this age group are curious, have newfound mobility, explore their environment by putting things in their mouth, and do not recognize danger,” Smith added by email. Big U.S. tobacco companies are all developing e-cigarettes. The battery-powered gadgets feature a glowing tip and a heating element that turns liquid nicotine and other flavorings into a cloud of vapor that users inhale. Smith and colleagues analyzed poison center data from January 2012 through April 2015. During that period, monthly calls related to e-cigarettes surged from 14 to 223, they report in the journal Pediatrics. Overall, there were 4,128 calls about e-cigarettes, accounting for about 14 percent of the roughly 29,000 total calls related to children’s exposure to nicotine and tobacco during the study. When kids got their hands on e-cigarettes, they were five times more likely to be admitted to a health facility and more than twice as likely to have serious medical problems compared to children exposed to traditional cigarettes, the study found. Most of the time, kids got their hands on e-cigarettes at home. Typically, symptoms from drinking liquid nicotine - like vomiting, nausea, and a rapid heartbeat - went away within a few hours. Among the children who needed medical care, less than 3 percent were hospitalized and roughly 2 percent had severe complications like breathing difficulties, seizures and comas. The study probably underestimates the risk of e-cigarettes, however, because it only includes cases voluntarily reported to poison control centers, the authors note. It’s also possible physicians might be more inclined to report issues with e-cigarettes because the devices and the resulting medical problems are relatively new. Even so, the findings should serve as a warning to parents because drinking liquid nicotine can be much more toxic to kids than eating tobacco found in traditional cigarettes, said Dr. Sean Patrick Nordt, an emergency medicine researcher at the University of Southern California Keck School of Medicine who wasn’t involved in the study. Liquid nicotine is easier for the body to absorb than tobacco in cigarettes, Nordt said by email. Because cigarette tobacco also doesn’t taste very good, kids are less likely to ingest enough of it to seriously hurt themselves. 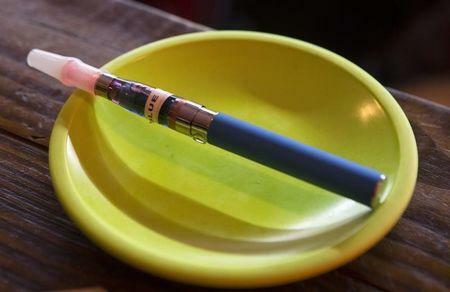 By contrast, e-cigarettes “can look and smell like candy to children,” Nordt added. Nicotine is also much more concentrated in liquids than in traditional cigarettes, noted Dr. Kyran Quinlan, a researcher at Rush University Medical Center in Chicago and chair of the council on injury, violence and poison prevention for the American Academy of Pediatrics. A cigarette has about 1-2 milligrams of nicotine, but liquid refills for e-cigarettes are often contain at least 18 milligrams, Quinlan, who wasn’t involved in the study, said by email. “A small sip, say a teaspoon which is 5 milligrams, exposes a child to the nicotine of several packs of cigarettes all at once,” Quinlan said. SOURCE: http://bit.ly/1Ok3g0f Pediatrics, online May 9, 2016.